Carey Timbrell loved being a part of the Hamlin School community. He enrolled his only daughter in Hamlin and never looked back, serving as an active board member from 1990 to 1998-well after his daughter graduated in 1993-and chairing the Development Committee. He was an Emeritus Board Member until his death in April 2014. "It was special for me to have a dad so involved in my school," says daughter Margaret Timbrell Hiatt, who served on the Alumnae Board from 2011-2013. "Some of my fondest memories are driving home through the Presidio at the end of those nights when he had a Hamlin board meeting and watching the flags come down over the Parade Grounds. He loved the school." Her parents were relatively new to San Francisco when they searched for a school for her, and education was a big priority for her dad. Hamlin stood out. "My dad's mom was a very strong woman. His grandmother was the first female director of a museum in the United States," says Timbrell Hiatt, an artist and mother of twins. 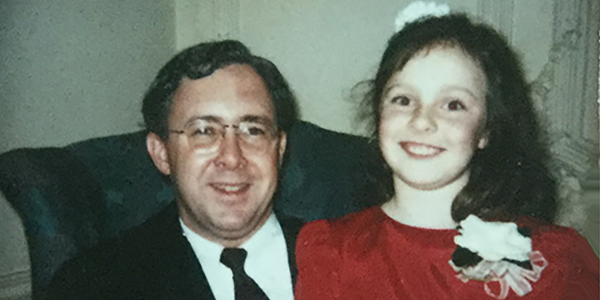 "My dad has always been very supportive of female education and feminism." Timbrell Hiatt says her dad learned through fundraising that typically families leave money to the husband's schools first and then the female partner's schools. Tired of girls' schools being on the bottom rung, he chose to provide for Hamlin through his estate and as a beneficiary of his retirement plan. "My dad was super involved in Hamlin and extremely proud of everything he accomplished. He really gave a lot of himself to Hamlin," she says. "I hope my dad inspires some people to give." Timbrell Hiatt pictured here with her father at a Hamlin Dinner Dance in 1989. The photo sits in its original frame made by Timbrell Hiatt in a Hamlin art class.